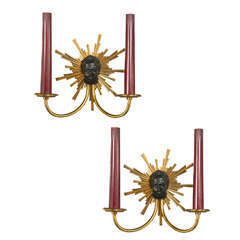 Sconces in hammered gilt metal bronze and enamelled red by the designer Nicolas Dewael for the foundry Fondica in Gisors France. No more productions today. Dewael is the last artist who have worked for Fondica with other artist like Pierre Casenove, Philippe Galerneau, Mathias. 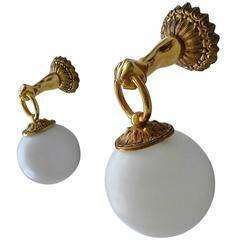 In the style of Garouste et Bonetti, Giacometti, Maison Jansen, Bagues, Charles, Hollywood Regency. 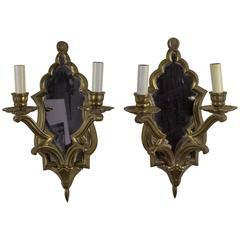 Pair of French, 1930s gilt bronze sconces with mirrored backplate. 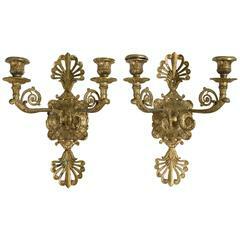 Beautiful pair of 1940s French gilt bronze sconces. 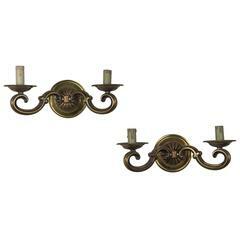 A pair of circa 1920, French Empire style double light gilt bronze sconces. 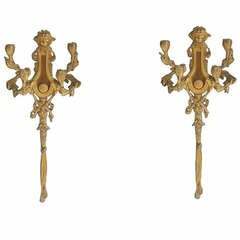 Pair of French gilt bronze sconces circa 1930's.